Isn't that how the song goes? No? Well, it would if it was a summer song instead of a Christmas song. I still don't know where she came from. But apparently, despite her disdain for humans and cats, she has decided to hang around. I think the neighbor's cat has finally given up trying to "get the chicken". And the once-feral garden kitty that lives in our garden is smaller than the chicken and avoids her at every opportunity. In fact, the chicken will run from me but not the cat. Go figure. We've dubbed the chicken "Ginger" or "The Big Ging" (Doctor Who fans should know the reference). She's been cleaning up on bugs, seeds, grass, strawberry leaves, leftover watermelon and chicken scratch (a mix of corn, wheat, millet and oats) so her feathers are in much better condition than only a week ago. She appears to have put on some weight too--which is good because she was so scrawny. So the "Big Ging" is getting bigger, thank goodness. I've also caught peeks of her when she doesn't know I'm looking and seen fluffy down in large tufts coming in around her legs. I think this is a good sign. Speaking of catching peeks... can you see her peering at me with one eye from behind the peach tree leaves in the photo below? I was wondering where she was spending her nights until yesterday when I stayed out in my chaise lounge until dusk. She meandered around pecking at things on the flagstones under the plum tree until she decided it was time to go to bed. She looked both ways a few times as if to see if anyone was looking, then crouched down low and sprang up in the most graceful chicken move I've ever seen. Flying up to the top of the wooden fence that divides our property from our neighbors' yard, she landed on the dog-ear-cut edge of the fence boards in a clearing between a rosebush and a liquid amber tree. She looked around a few more times, then carefully walked along the ridge of the boards and stealthily ducked under the branches of the liquid amber. 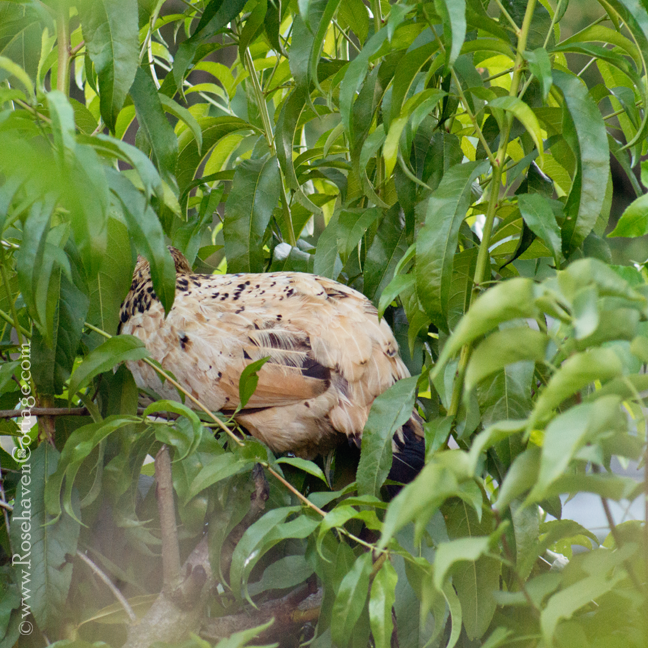 I saw some rustling as she made her way through the branches and hopped up into the branches of the neighbor's peach tree that is right up against the fence with its boughs hanging over into our garden. 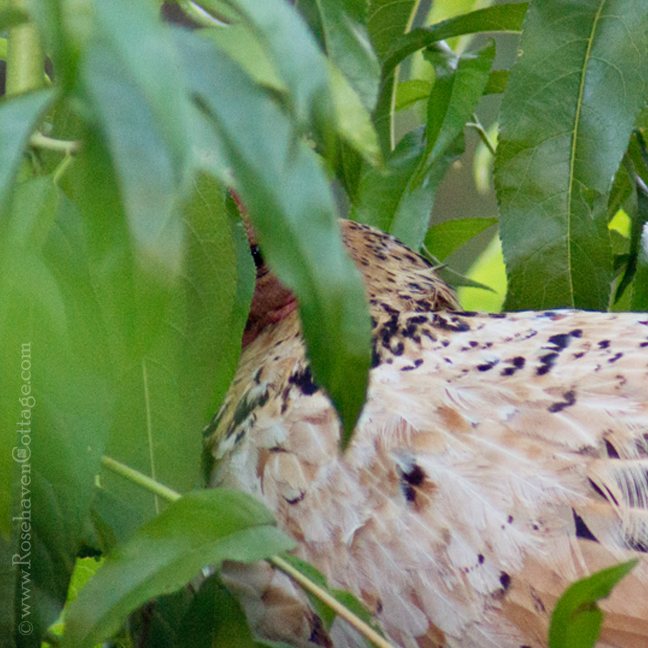 When the rustling finally settled, I ventured around for a better vantage point without startling her and found she had roosted in a crook left in the branches from the neighbor's latest pruning. This evening, I was again sitting outside at dusk (one of my favorite pastimes) when she fluttered up to the fence again to go to bed. Hubby joined midway through and got to watch the last half of her roosting ritual. After she appeared to be settled, I ducked inside to get my camera and telephoto lens. I captured a few shots of her from the other side of the pond. When I came inside, I discovered the above photo with her little eye peering at me from between the peach tree leaves. She's very suspicious of everything--particularly me and my camera. Feral chicken? Ha ha ha!! Wary, suspicious chicken ... knows that she's contraband, according to the town. Protecting you by not allowing herself to be tamed, so you're not liable if the 'Fuzz' comes to the door. Well, she's a survivor. Her wariness got her this far and I've no doubt she's had her share of close calls. Chickens will eat flowers, etc., so I hope she doesn't do any damage to your beautiful garden. That said, it sounds like she's happy for a safe place to roost, so perhaps she'll be respectful of her new home. Me thinks you've got yourself a chicken ... and a lovely one at that. Where ever she came from she is much better off with you. And the signs of health returning means she is loving your garden. This wise bird knows a good thing when she finds it! I'm so happy that she's thriving in such a happy place. Actually, I can't think of a bless-ed living creature,human or otherwise, that would not thrive in such a lovely place as the Rosehaven Cottage gardens. Looks like you've got yourself a serendipitous back yard bird. How wonderful.